This project started off as a dual power supply with both low and medium voltage supplies in a single case but the resulting packing density was so high that it was not maintainable so the supplies were re-engineered into two separate cases. 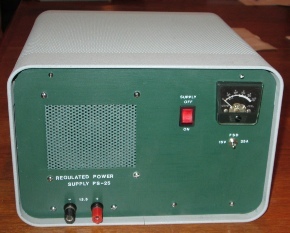 This supply is the low voltage unit capable of 13.5V at 25A and built into a Heathkit SB-600 loudspeaker case. Protection includes a 27A preset current limit and a 15V triggered crowbar. 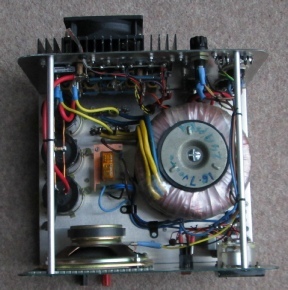 The heatsink has a temperature controlled 12V DC fan which is extremely quiet in operation. 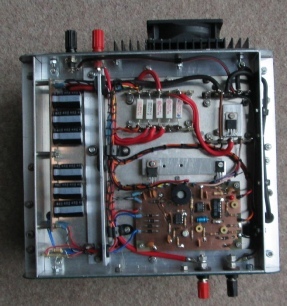 The front panel contains one DC output, mains supply switch, loudspeaker, meter and meter range switch. 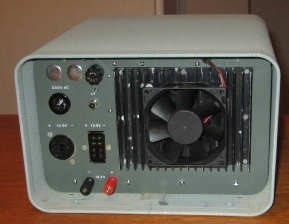 The rear panel contains the regulator power section in its heat-sink with the cooling fan, three DC outputs, mains connector and fuse. The depth of the chassis has been adjusted so that rhw cooling fan does not protrude beyond the back of the case. The photo to the right shows a view of the top of the chassis with the toroid mains transformer, 45,000uF of smoothing and the inrush current limiter left of centre. The small transformer under the meter provides a separate 22V 0.4A supply for the regulator IC, crowbar and cooling fan circuits. The heat-sink contains the high current bridge rectifier, five output devices, driver device and current sharing resistors which also form part of the current limit circuit. The photo to the right shows a view of the underside of the chassis with the low current smoothing on the left, 4 milli-ohm current shunt, control PC board and low power devices heat sunk to the chassis. All internal wiring is decoupled at RF. The final assembly is easy to maintain and has no unusual or rare ICs or components.